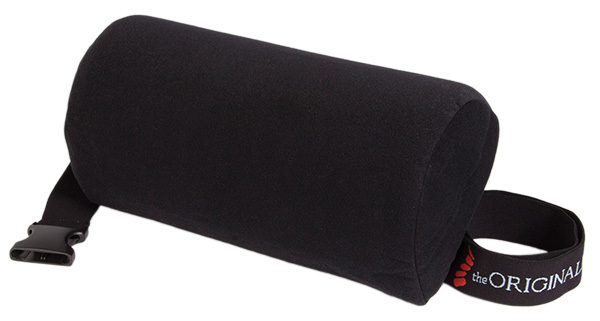 The Original McKenzie lumbar rolls are excellent, affordable solutions to mild back pain. They come in four different styles - 4” roll, 5” roll, Super roll and D-shape roll. The McKenzie Super Roll is a firm favourite among customers. It is nicely shaped to sit in the lumbar area, the shallowest depth being 2.5” (6cm) and comes in standard density foam. The McKenzie D-shape Roll is the tallest roll at 6” (15cm) along the flat edge, with a depth of 5” (13cm). It comes in the standard density foam and is ideal for flat backed seats. The McKenzie 4” and 5” rolls are standard circular lumbar rolls and are available in two different densities. If you are looking for a portable and adjustable lumbar support the very popular Sitting Partner has an inflatable bladder which can be blown up and let down to meet your needs. If you are suffering from chronic back pain we would recommend you read about the Mobiliser. Visit us in store or call us. We are Europe's largest back pain retailer and help thousands avoid and beat back pain every year. The Original McKenzie - Super Roll - Depth 2.5' (6.5cm) - A customer favourite. Perfectly shaped, shallow depth and standard foam. The 4'' roll is available in (soft) standard foam or premium (firm) heavy duty foam. The softer standard foam is typically more comfortable and the firmer heavy duty foam is more supportive. But in truth it depends on your size, weight and personal preference. The 5'' roll is available in (soft) standard foam or premium (firm) heavy duty foam. The Original McKenzie - D-Shaped Roll - Depth 5'' (10cm). Ideal for flat backed chairs.